We have a tradition at Chez Peady. To be truthful, we have many, but Friday Family Fun Night has been a part of our family, practically since we became a family. It may have started with a frazzled, hormonally charged “I am a failure as a mother and therefore as a human being!”, but I assure you it has evolved into a lovely family tradition over the years. Friday Family Fun Night can be anything that works for your family at the end of a busy week. We have, on occasion, even moved FFFN to Saturday to assure a more relaxed experience. I know we can’t be the only set of parents, come Friday, who would really just prefer to crawl into bed and zonk out until the light of day. We are not alone, right? RIGHT?! I didn’t think so. We tend to change up our FFFN activities on a regular basis so that it doesn’t just start to feel like yet another obligatory “scheduled something” that we have to do. That being said there is one component that seems to have rooted itself deeply into our Friday night plans. Can you guess what it is? No. Guess again! No. Guess again! It’s PIZZA! Pizza always plays a part and on a Friday night there is NOTHING easier or more appreciated than a delicious, cheesy pizza. Wait. 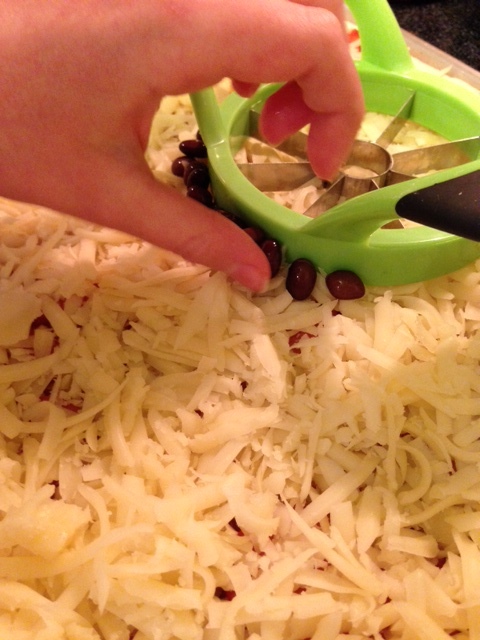 When you are a kid, there kind of is – it’s making your very own pizza! The Things are pretty creative and over the years we have had a myriad of pizza themes and shapes. From faces to animals to the Death Star and many things in between. I know that, traditionally, today is a day for hearts, but that would have been cliché and besides with all the Olympic *love* we are seeing and hearing about, tonight’s theme was obvious. We would make an Olympic themed pie. Specifically, we would make the Olympic Flag. And we did! This time we really had to think about what kinds of toppings we could use to make those iconic Olympic Rings. We needed blue, black, red, yellow and green. 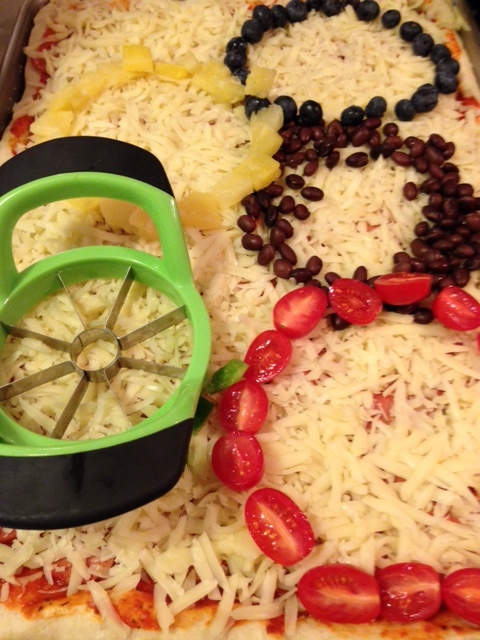 Some toppings popped immediately into our minds. Green peppers and tomatoes seemed obvious choices for green and red. Three out of four diners enjoy green peppers and tomatoes on their pizza, too, so that was a done deal. It took only a second more to come up with pineapple, which everyone enjoys, for yellow. Great! Thing 1 then had a “Eureka!” moment and shouted “Black Beans are black!”. Terrific! Now blue. Blue was tricky. 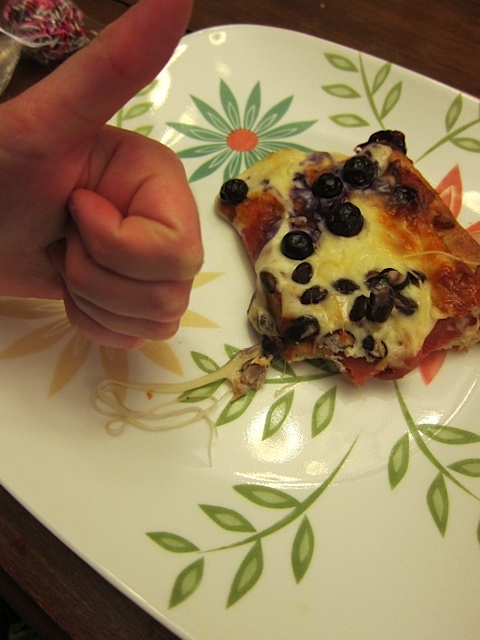 There was a rather lengthy discussion about which would be more disgusting on pizza: blueberries or blue cheese. Blue cheese won the prize for grossest topping because “it has mold!” and then there was further discussion about the fact that all cheese has mold, but some molds are more scrumptious than others. (Thing debates are the best! I should really record one one of these days.) 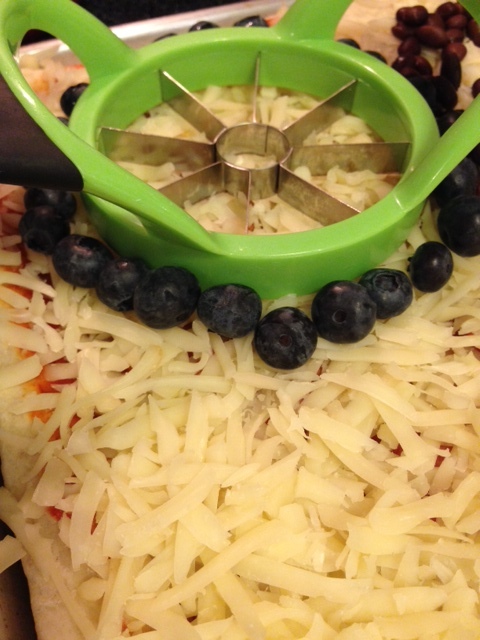 In the end, blueberries won their place in Olympic pizza history! We think it turned out great. What do you think? 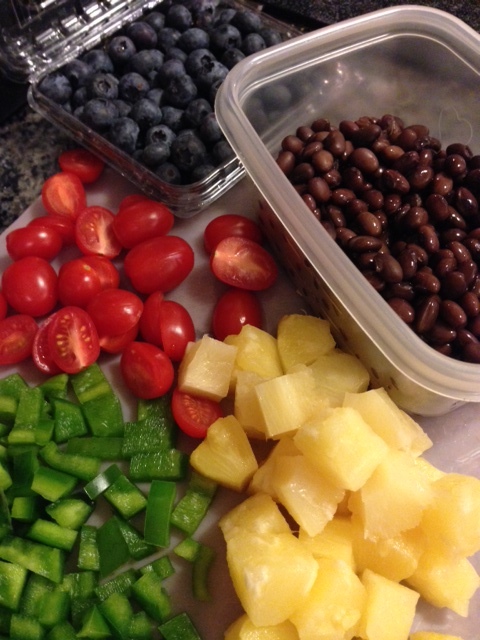 Green peppers, pineapple, tomatoes, black beans, blueberries. Yummy! Thing 2 added the blueberry ring and ate a LOT of blueberries in the process. Almost done! What do you think? Doesn’t this look delicious? Ta daa! 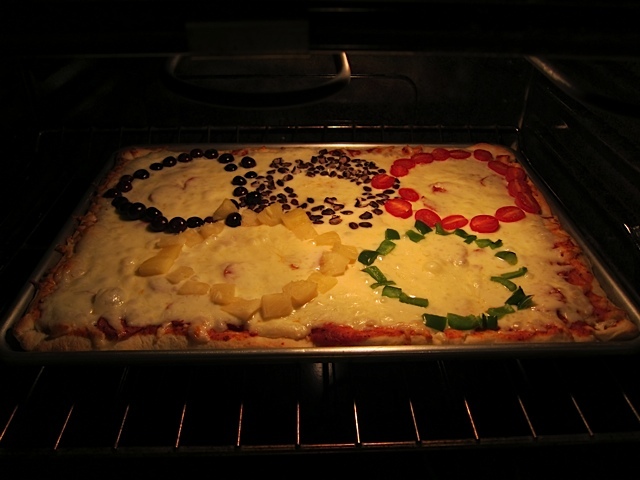 An Olympic pizza. Thing 1 approves of his blueberries and black beans. Olympic Spirit: Go Canada Go! Wow! What an amazing day for Canada’s Olympic athletes and Canadians at large! Currently Canada has a total of 7 medals – 3 Gold (WOW! ), 3 Silver (W00t! ), 1 Bronze (Yippity biscuits!) and is tied with Netherlands and Norway for the most medals. That is a great start, wouldn’t you say? With so much speculation leading up to (and political buzz surrounding) these Sochi games, I am glad that, so far, the athletes have been able to focus on their individual and team events (aside from some funny tweets, a few crazy bathroom photos, a trapped athlete and some judging rumours) without too much controversy. The Americans had our flag on their floor in the dressing room and now I want know if they want us to sign it. Whoa! I was amazed at how calm and pointed her question was. It, at once, raised her level of cool while pointing out a pretty awful example of sportsmanship on the parts of the American players. Nothing more needed to be said. She got her point across and her little dig in. I’m sure it’s all water under the bridge by now. Right? Are you watching all the action from Sochi? Are you lucky enough to be there? Are the games making you feel extra pride for your country, homeland or heritage? Does seeing all the amazing athleticism make you want to go out and play more than usual? How are you using the Olympics to foster the joy of sport or activity with your kids and family? Me? I got a Silver medal just for showing up today. Mondays are hard and Thing 2 is a very generous judge. Sure, I didn’t win Gold – that was reserved for Thing 2, but I received Silver, while Daddy-O only got Bronze, so, you know … WINNING! This is *my* Silver Medal. Not too shabby, eh? 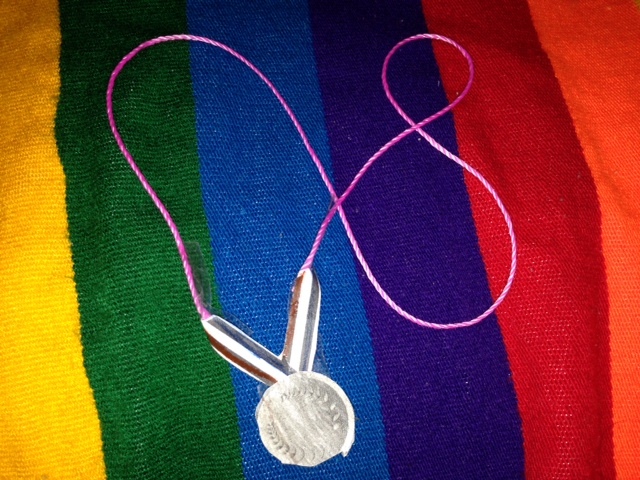 If you are interested in making some medals of your own (or with your kiddos) here is where Thing 2 got her templates. There are also some great activities and printables here, lots of good information here, and some good Canadian stuff here.